Future wars will no longer be about oil, they say. They'll be about water. When thinking about water usage, the first thing that comes to mind is drinking water. However, an average household needs only about 2 to 5 liters of water every day for drinking and 100 to 500 liters for everything else like showering, washing, etc. This is almost negligible compared to the 2000 to 5000 liters which are necessary for the cultivation of food for an average family. What role does the meat consumption play in this case? Order the leaflet «Water is precious» for free. In combating the worldwide hunger, food supply is often mentioned. However water, which is necessary to produce food at all, is mostly neglected. In 2004, a water conference with participants from more than 100 countries took place in Stockholm and exclusivly dealt with the water supply of mankind. According to the findings of the conference, the problems connected to the supply of drinking water were often made on the topic by the media. Unfortunately, one of the main causes for the soiling of the water in the industrial nations was neglected again: the livestock farming. At the conference interesting but also frightening facts came to the light. About 50% of the water soiling in Europe is to be led back on the prodcution of animal food. Most of the water is used by the humans to produce their food. Grain belongs to the useful plants whose cultivation requires particularly a lot of water. 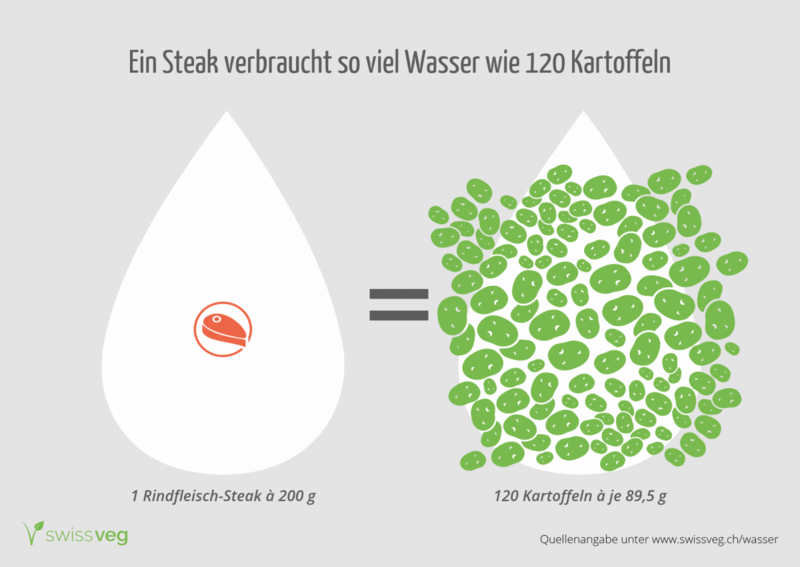 Therefore , meat is – which requires the sevenfold amount of water as grain – a food which devours mostly water: for 1 kilogram of chicken 35‘000 liters of water are needed, for a kilogram of beef even 100‘000 liters. 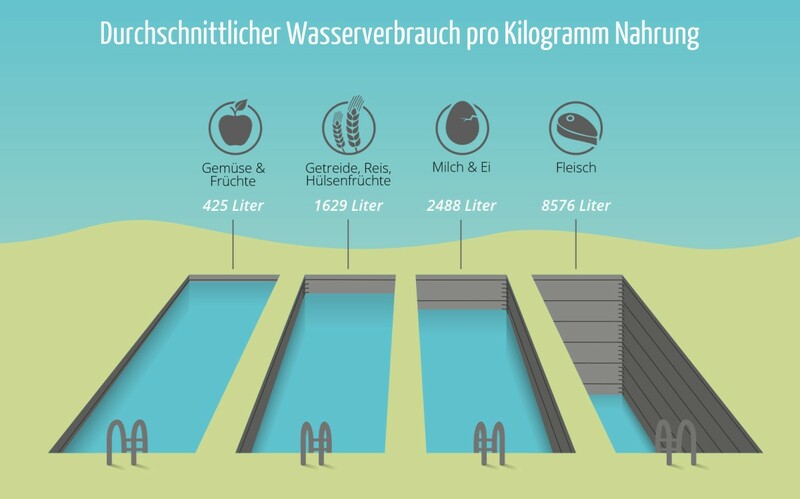 In a hamburger (125 grammes) are nearly 13‘000 liters of drinking water. In this calculation is included: the irrigation of the fields, the impregnation of the cattle and also the water consumption during processing and transportation. Wether a family needs 2000 or 5000 liters daily for their food, depends very much on their eating habits. Worldwide on an average about 1200m3 water per year and person is required for the food production. In the poorest regions of the world where they can hardly afford animal products the value is approx. 600m3 per year. In contrast, in the regions where the most meat is consumed (USA and EU) about 1800m3 per year and person is needed. Notelet «Steak vs. potato» order for free. Herbal foods need on average only ten percent of water as meat. Only 300 liters are necessary to produce 1 kilo of potatos, about the fourfold for 1 kilo of soy beans or corn. 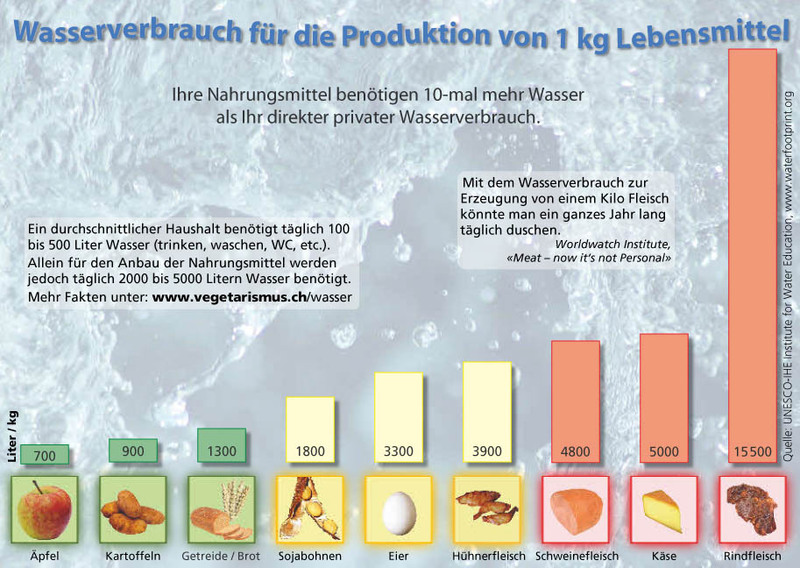 For the daily diet on a purely vegetarian base with an energy content of 2500 calories (world average at the beginning of the nineties) 360‘000 liters of water for every earthling per year are required according to US investigations. When people‘s diet contains at least 20 percent of meat, the water consumption rises to around one million liters. In the USA and Canada – the two countries with the world‘s largest meat consumption – the food-related water consumption is just under 1.7 million liters per person. The worldwide water consumption has increased sixfold since 1950. Of course, water shortage in Switzerland is due to its geographic situation and the Alps not a big problem. Still it would be wrong to ignore it. Through the import of nutrition (incl. animal feed) water is imported virtually, because it is needed to produce at the production place. This way it can be saved in Switzerland. Unfortunately, the water shortage hits always the poorest populations first. Due to the huge demand of water in agriculture more and more pumps are being used, which pumps the ground water to the surface. Poor farmers can only afford hand pumps or low-performing, simple pumps. If the ground water level drops by several meters, the many small wells dry out first, since they cannot inflate the water from a great depth. In India, the water has to be pumped up from over 1000 meters in some regions. Just a generation ago hand-dug wells were more than enough for their irrigation. Today, 95% of the small pump places are already dried out. In other Asian countries the development also looks similar. It is noteworthy that in spite of these impressive numbers, which clearly emphasize meat production as the largest water consumer, the vegetarian diet is not addressed in the corresponding studies. It does not seem appropriate for scientists to mention it as a possible alternative. This suggests once more that scientific neutrality is not guaranteed in the subject of meat in the diet, since every scientist is either meat-eating or vegetarian.